Still not ideal but this map of my progress is a little better than the last version. Since I flew into Amsterdam when I arrived in Europe I have already begun my exploration of the Low Countries, (Netherlands, Belgium, and Luxembourg). My plans are still developing and although I originally planned on visiting all three countries I am not sure I'll be able to spend time in Luxembourg. I may have to cut out some days and save Luxembourg (and Paris) for another trip but that sometimes happens. I did add a day in Norway and 3 days in Berlin after all.. The night train from Berlin brought me into Brussels very early in the morning. So early in fact nothing would be open so I immediately jumped another train to Bruges. It is a well known medieval town near the coast. Anyone who spends time in Belgium goes to see that town because it is so well preserved. Since I wasn't planning on going inside anywhere it didn't matter how early I arrived. At 08:30 I was walking around taking photos. I'm surprised by how many I took and how much I walked. I finished up with climbing to the top of the bell tower. I almost didn't because it was 5€ and I've been to the top of a lot of towers, but the weather was clearing up and I thought it might be nice. I'm glad I did. The bell tower was really cool, the views great, and as a bonus the bells started ringing. It wasn't easy picking which Bruges photos to upload. Ghent lies between Bruges and Brussels and is like only two train stops from the former. It is a quick and logical stop. 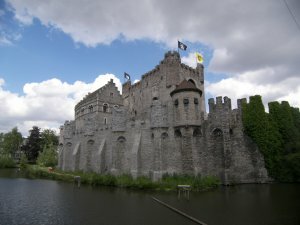 My main reason for going was the Gravensteen a 12th century fortress in the center of town. First it served the Count of Flanders then the Council of Flanders. In the 1500s Ghent was Europe's second largest city after Paris. The old town is very large and obviously had money. The buildings are beautiful although as a whole the old city isn't preserved as well as in Bruges which I suppose is why so many tourist skip it. Don't do that. Go visit if only for the castle. Brussels had one thing I really needed to see. 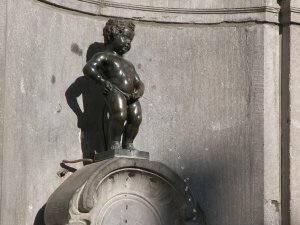 Much like Copenhagen and the famous Little Mermaid sculpture, Brussels has Manneken Pis. Even if you have never heard of it there is a good chance you have seen the statue of the little boy peeing into the fountain. It's famous. I walked over there from the Gare Midi train station and joined the tourist horde in front of the very small Manneken. I came, I saw, I photographed. Next stop the Grote Markt which was an exceptionally photogenic square. In all Brussels was a great stop. I'm back in Amsterdam and reunited with Josje. I have lots to see in this country. Since the distances involved are small I plan on day tripping from Amsterdam. Check back to see how that progresses. My first day back I took an afternoon trip to nearby Haarlem. It is much the same as the other towns in have visited recently. I did my typical little strolls around the center. I didn't get excited about any of the restaurants so I decided to stage a quick picnic as I saw a grocery store earlier. So that's how I ended my little Haarlem excursion - on a park bench almost clobbered by a frisbee eating smoked eel and raw herring with onion. On a side note next impromptu picnic with finger food I need to find a park with a place to wash my hands afterward. Raw herring are slippery devils! An Amsterdam site on most itineraries is Anne Frank's house. Because of potential long lines it is recommended to arrive either really early or really late. I chose the late option after returning from Haarlem. Perfect. There were few other people there and no line. What I've heard and read is correct. 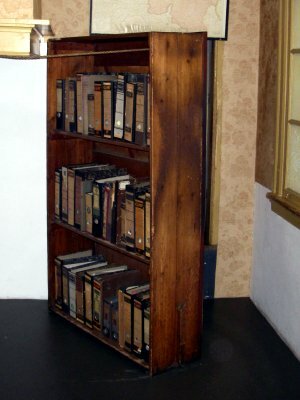 There isn't much inside, but some of her diaries are on display upstairs and you can go through the bookcase and into the "Secret Annex". There wasn't a lot of space for 8 people to live for years although since the rooms weren't furnished it looked bigger than it was. 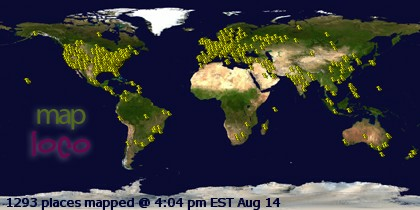 I did put a few pictures online. On Friday Josje and I took an early afternoon train to Maastricht in the south of the Netherlands. It is located in a strip of hilly country between Belgium and Germany. There are lots of things to see including some Roman remains and 13th century fortifications including the earliest surviving gate in the country. Above the city sits the fortress of Sint Pieter. Day 1 was for the city sites including small Roman ruins in a hotel basement and Bastion Waldeck / Kazematten a 17 century fortress with tunnels (near to the place where the famous French muskateer d'Artagnan was killed in the 1673 siege). 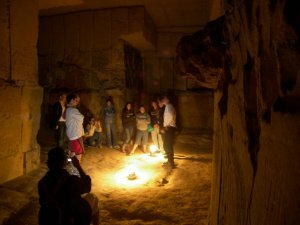 Day 2 was for exploring the nearby somewhat well known fort and ancient quarry at Mont Sint Pieter. I finished the day with a barbaque at Josje's sister's backyard (right behind Josje's place). All the usual foods were represented: hamburger, chicken, kebabs, and even marshmallows which I am told are relatively newly found in Netherlands stores. 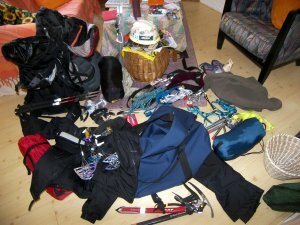 This was a packing and planning day for the Alps. After a while, what I decided though was to not hike the Tour du Mont Blanc before meeting Irina in Chamonix. The ten day forecast for the area doesn't include a single day of good weather. Most days should be cloudy with a 60% chance of rain. There is no reason for me to rush down there for that. That gives me some extra days. Oh what shall I do? The photos have been up for a few days before I got around to writing this day. Josje works in Utrecht some days so we took the commuter train down there together this morning. 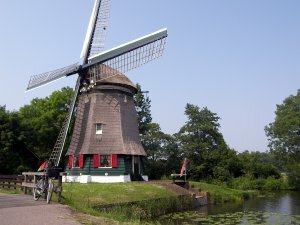 Utrecht is nice but not a big tourist stop and there are several interesting places to visit nearby. I chose two, Amersfoort and Kasteel de Haar in Haarzuilens. Back in Utrecht I left from the train station on a bus to Haarzuilens. I wasn't expecting anything from the village at all. I was getting off there simply for the 2 km walk to the big castle. There must be a lot of tourist euros running through the place though. No small village can be so quaint and in such good repair without good money. What do you think? Haarzuilens photos. 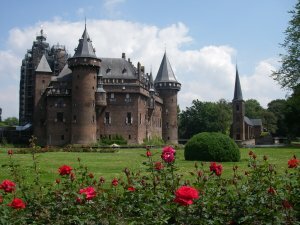 As I wrote, my real goal was Kasteel de Haar. The original castle was destroyed and rebuilt in 1482. It later fell into ruin but was repaired and updated with modern conveniences like running water and electricity beginning in 1892. There is some restoration work still happening too. Unfortunately the castle is closed on Mondays so I paid my 3 euro to walk through the extensive grounds and shoot my Kasteel de Haar photos from the outside. Still it was well worth the effort to get out there. And the castle being closed to tours explained why the two restaurants back in Haarzuilens were closed when I returned to wait for the bus. Instead I found a little petting zoo just beyond the square to occupy my time. Finally I started exploring Utrecht in the afternoon. I was tired of taking pictures but I did manage some Utrecht photos to make my set for the day complete. It has a nice historic center. The unique thing here was that street level is a full story above canal level. In other words to eat at a true canal-side cafe a person has to descend a flight of stairs. This is the day I forgot my keys to the apartment. I didn't figure that Josje would be too long but I was wrong. I spent a couple hours waiting but I had done some shopping so had some meat, cheese, and wine. Time for a picnic. One of her neighbors provided me with a chair and a corkscrew. Good times. Sleeping in and souvenir shopping were my primary activities so no real news. I usually leave shopping to the end of the trip thinking that I have plenty of time, but usually I'm rushed on the last day trying to do my shopping. So I'm getting a few things now and I could use an extra shirt or two for general purpose wearing anyway. Wednesday night I took a late bus to Edam (of cheese fame) where Josje's friend Corine lives. She offered to let me spend the night and check out the area the next day. The Netherlands walled off part of the ocean and created the Ijsselmeer which is now freshwater. The area is dotted with traditional fishing villages and towns that lost their livelyhood and now cater to tourists. This was a great experience. It was a beautiful day and Corine loaned me a bike, provided some bottled water, and cooked up some chicken wings. True to the guidebook Edam was empty of tourists and for no good reason. The famous cheese market, or kaas markt, isn't held until summer but the place is just as nice as any other. A few kilometers down the road Volendam was overrun with tourists and buses. That town is right on the Ijsselmeer sea so I suppose that explains it. The plan that developed for the day was to bike around Edam and Volendam. I also sampled some fish from a harborside stall to add to Corine's chicken. From Volendam the bike and I took the ferry over to Marken island which is home to an old fishing village with some unique homes. Then from there I'd bike south along a dike back to the mainland. Eight more kilometers or so along the shoreline and I'd be in Monnickendam. Corine would either pick me and the bike up on her way to Amsterdam or I'd leave the bike there for her and take the bus back to Centraal Station. My little bike tour of the area went off without a hitch as I explored all these little places. As a bonus I didn't even have to wait long for bus 111 back to Amsterdam. When I woke up Josje already had my laundry out to dry. Such service! This last day was an easy day. I finished the pack job that I began earlier and since it is cumbersome to carry all my gear I made a trip downtown with my big backpack. I put it in a locker within the Centraal Station so I wouldn't have to carry it along with everything else tomorrow. Other than that I did some small website updates and picked up dinner in the city center. Amsterdam has proved a hard city to leave much like Asheville, North Carolina, although that may be the only times those two places were ever compared. Next I am off to Paris on my way to Chamonix, France to start the major climbing portion of the trip.